Small and fun to use, if a bit high in price. First shown off at Hascon (late last summer), the Tri-Break is expected to hit stores in the US early next year. However, the Tri-Break is already at ToysRUs in Canada. As such, I now have one for review and light modification. The Tri-Break doesn’t break new ground in any sense. It takes the now-quintessential “Jolt prime” method of propulsion and mates it to a three barrel smart AR. 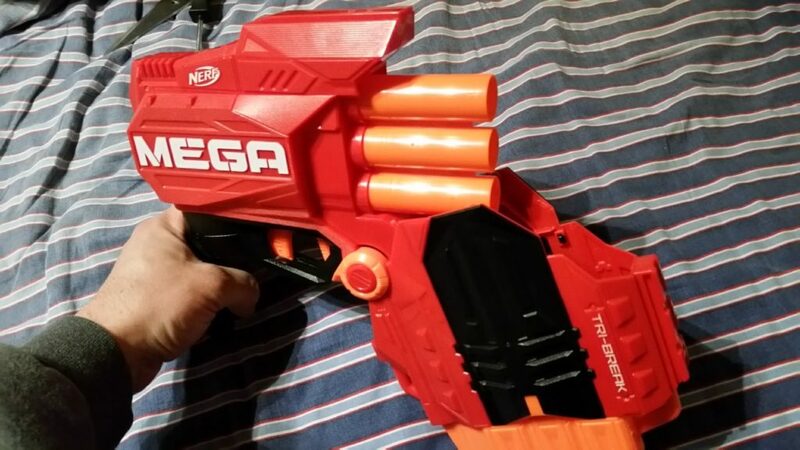 Instead of three Elite darts, like the Triad, it fits three Mega darts. The main “gimmick” of the Tri-Break is the break-action mechanism for loading. A large plastic cover swivels over the barrels, and is released by a secondary trigger in front of the main trigger. The front cover is completely cosmetic; in all reality, it is mostly unnecessary. Hasbro could’ve simply enclosed the three barrels for a sleeker package (and cheaper, with less plastic). 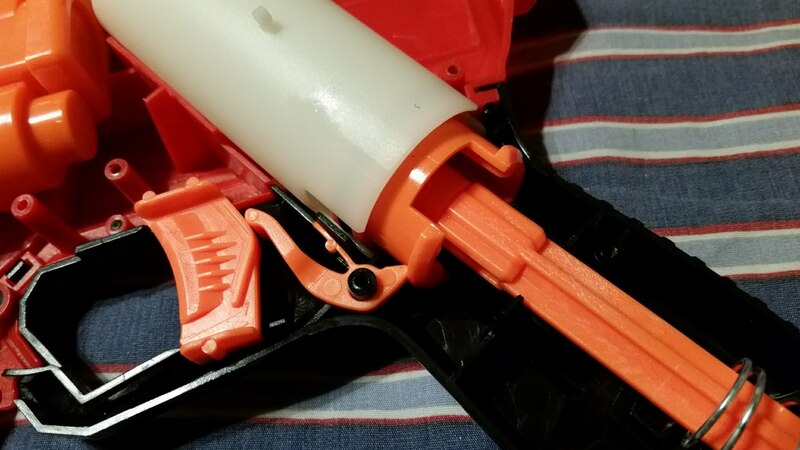 Even so, breaking open the front to load the blaster is somewhat fun to do. Given the target audience (children), that part ultimately wins out. Plus you can easily swing the barrel shroud back up to close it! Still, a sleek package, and possibly a $10-$12 price point would make this more appealing to the wallet. On the inside is exactly what you’d expect. An upward facing plunger feeds into a smart AR system. The plunger has approximately 70mm of draw, and the plunger head measures about 31mm in diameter. Granted, only the last 1/3 of the plunger tube is narrow enough to make a tight seal. But it’s enough volume to make the system work as intended (too much air volume in a smart AR results in later barrels firing prematurely, as well as pitifully). IT’s an impressive package for its size. The front trigger pulls back a spring-loaded latch, which holds the hinged barrel cover in place. The main trigger, meanwhile, presses against a small sear that holds back the plunger head. There is no extra spring here – a thin strip of plastic serves to provide the spring force (of which very little is needed). 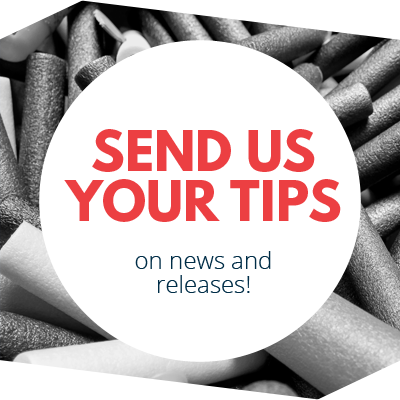 There are no extra plates for holding the plunger spring in place – the handle is molded with spring rests. If you look carefully. you can see the bottom of the spring through the holes in the handle during regular use. 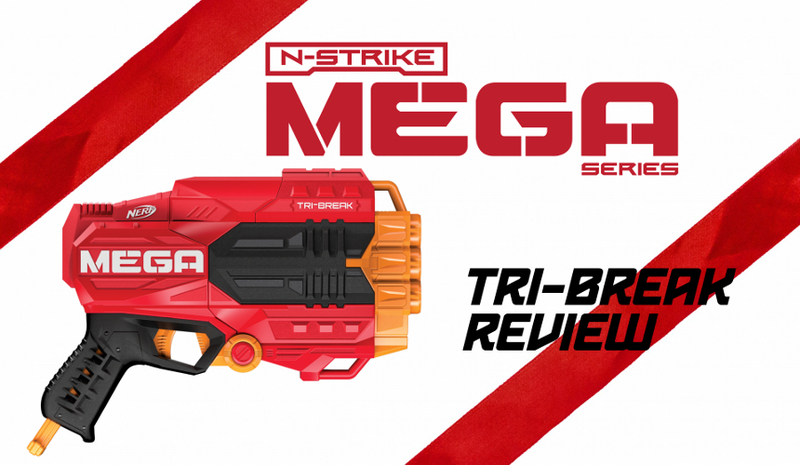 In stock form, the Tri-Break offers decent results for firing Mega darts. Starting with the first barrel, shots were averaging 67 feet per second, dropping to 63 fps on the second barrel and 60 fps on the final barrel. The slight losses are to be expected – each empty barrel means a little extra distance for the air to travel to reach the next dart. As a reference, the Magnus pistol tends to average around 70fps, if not a little more. The stock spring, while producing respectable results, is still low in strength (as well as diameter). 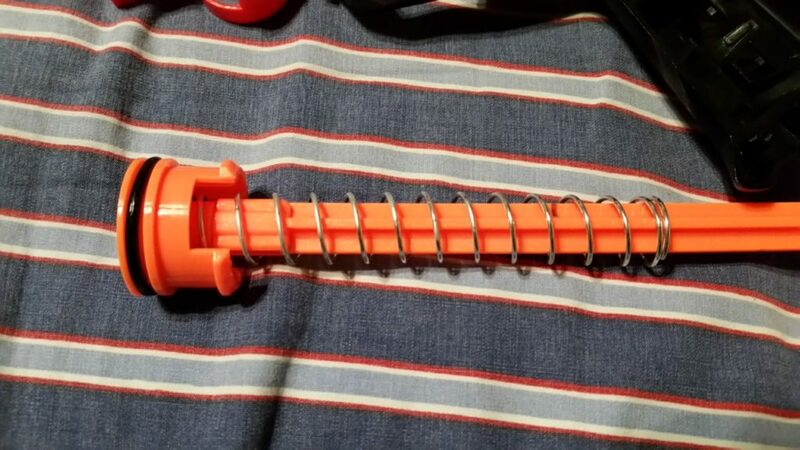 If you have two Maverick springs handy (or a single Glow Show Sticker Launcher spring, which otherwise has the same dimensions but twice the coils), thread them over the plunger rod. Doing only that results in chronograph readings from 80-90 fps, with the highest numbers on the top barrel. At those speeds, stock Megas are highly unlikely to fly accurately towards your target. If you still have Buzz Bee XL darts, however, you can sacrifice a few fps for decently aimed shots. And of course, the smart AR still works as intended. After use in a war, I came to the conclusion that the Tri-Blast was simply fun. 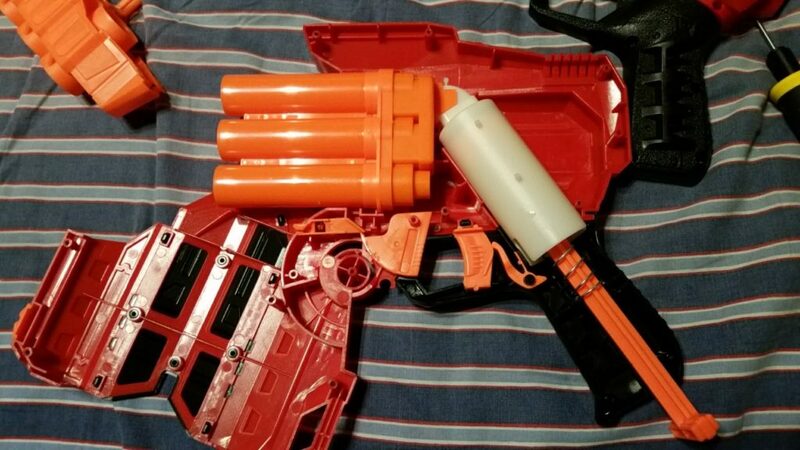 Sure, the barrel cover is completely unnecessary and adds to the blaster cost. But in actual use, flipping the cover down with the secondary trigger, loading, then swinging the entire blaster upward to close it was fun. 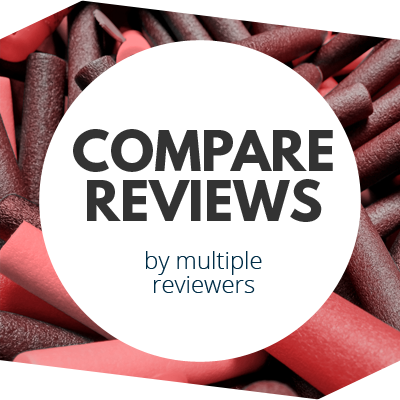 In addition, the performance is more than adequate for a small Mega blaster, with easy room for improvement. 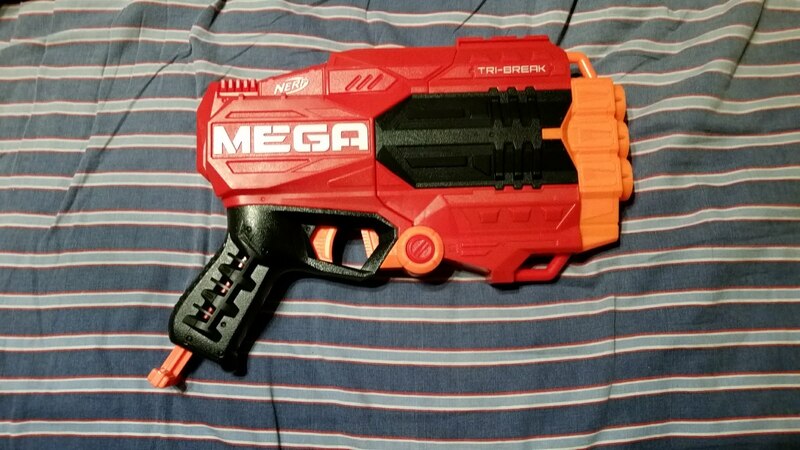 Granted, a $15 asking price isn’t the best, especially when it’s easy to obtain blasters like the Magnus, Dual-Strike, and Cycloneshock for $15 or less depending on store and sale. But for what it is, the Tri-Break is a fun little blaster. 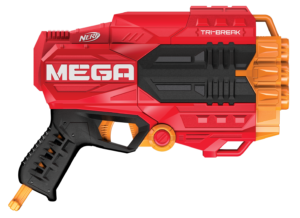 This entry was posted in Dart Blasters, Reviews and tagged 2017, blaster, blaster hub, hasbro, mega, nerf, review, tri-break on December 18, 2017 by BuffdaddyNerf.